It’s been a week or so since I got my new radio. As pictured it’s the Yaesu FT-60R. And I am loving it. There are a few minor things that the Icom IC-E90 I had the edge on, but nothing to do with the radios performance. The Icom had a seperate power switch meaning the volume remained where you left it. Also it could receive FM broadcast bands. Right now I have that out the way, how am I finding the rig. I have had only a few QSOs so far, but the reports have been good. It’s also built solidly which is why I went for this radio. I have heard it’s so strong, some shops where you can buy it they have one they throw across the shop to prove it’s strength to customers (but I am not going to try that yet with mine). Over the Christmas period I shall give it a good use. On Christmas eve it will travel with me to my nans, and will keep it on Christmas Day. I have also ordered a cable as the radio has 1000 memories, so I don’t intend to program them manually. Other 1000 memories with alpha-tags. As usual I attended the Kempton Park Radio Rally on 4th November. It was an early start for me as the person who was giving me a lift had to leave at 04:45am. Ouch. So alarms were set and I woke up an hour early thinking I may have missed alarm and could get back to sleep. Instead I played a couple of games of bejeweled with my friend JW on MSN. We arrived at Kempton about 5:30 and I helped set the tables with the info displaying where the vendors and clubs would be. After 6am one of the big Vendors arrived with their Transit stuffed full of Amateur Radio items to sell. I helped them un-pack as I normally do and then other traders and clubs started turning up. After the 2nd large vendor was unpacked with my assistance I went to our clubs tables and added my 2 items with prices. I put up for sale my Icom IC-E90 handheld radio and my Squeezebox wireless music player. At 10am the punters were let in to spend their hard earned cash and I was busily checking that everyone had a ticket. When someone could cover the door I went and brought 2 copies of the RSGB Prefix guide (one for M0BOV) and went back to keep on checking the tickets. A while later I had a call on the radio that someone was interested in my radio. The person was tempted and the haggling began. Eventually we settled on a price and the sale was made. Time for some more shopping. As I had helped one of the vendors I got a good price on some items. Alas the music player was unsold and when I arrived home was unpacked and back in old position. All in all apart from being knackered when I got home was another great day. And the M0TZO shack is getting better. I got in touch with my uncle last weekend, and during our video chat using iVist, he mentioned that he may be giving me an amateur radio/scanner. It would be the Icom IC-E90 as pictured left. 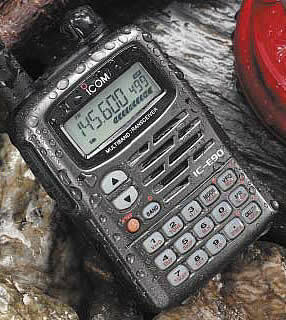 From the ICOM website:- Icom announces the debut of the IC-E90 multi-band handheld transceiver. This transceiver covers 50MHz, 144MHz and 430MHz bands and is equipped with a wide band receiver, which covers 0.495-999.990MHz in AM/FM/WFM modes. If that isn’t enough, the IC-E90 comes as standard with a 1300mAH Li-Ion battery ideal for long operating periods and provides 5W output on all bands! All these great features are built into an ultra compact body, measuring only 58x87x29mm! I have so far only seen images on the net about this Radio. But I love how small it is. It apparently can also be used as a Radio Scanner. How Amateur (Ham) Radios Work! In doing some research, I have found a local club called The Sutton And Cheam Radio Society. The society has been running for 50 years and are an affiliated member of the RSGB (Radio Society of Great Britain). It's been 14 years, 8 months, 0 weeks, 2 days, 3 hours and 59 minutes since I gave up smoking. I've not smoked 45875 Cigarettes nor spent £15,253.44. EXC.